Place chocolate and butter in 8x8-inch microwave safe baking dish. Microwave on HIGH 45 seconds; stir. Microwave an additional 30 seconds. Microwave heavy cream on HIGH 45 seconds; stir in chili powder and salt. Pour hot cream over chocolate and stir until melted and combined. Cover and refrigerate 1 hour or until firm. 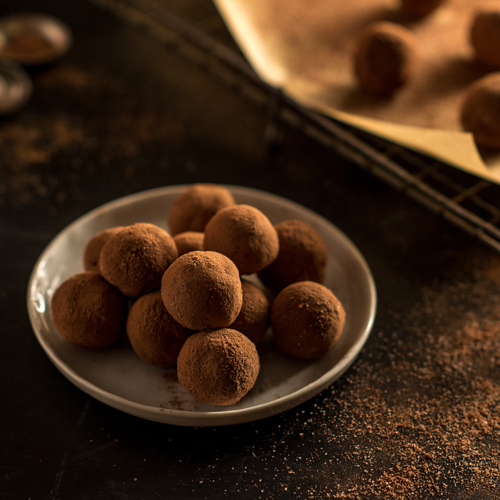 Use a melon baller to scoop chocolate mixture and shape into 1-inch balls. Roll each truffle in cocoa. Serve truffles at room temperature. Powder free latex gloves will make for mess-free rolling.